Are CD Players Still Sold? Honestly I don’t know how much time the CD’s will last in this latest generation WiFi, Bluetooth, USB stick era, however it is evident that there are high selling CD players in market and they are still liked by many! So my quest to find the best portable CD player took me to research on Amazon best sellers which are also in affordable price range say around $30 or so. So the quest was for Value for Money type high selling products. Surprisingly these small Plastic body CD players have crystal clear sound quality, much more color choices, programmable memory as well as you can listen CD/CD-R/CDR-W. A built in AM/FM radio tuner with telescopic antenna let you listen your favorite tracks without any signal interruption. So now simply enjoy full function, portable audio at home or on the go. 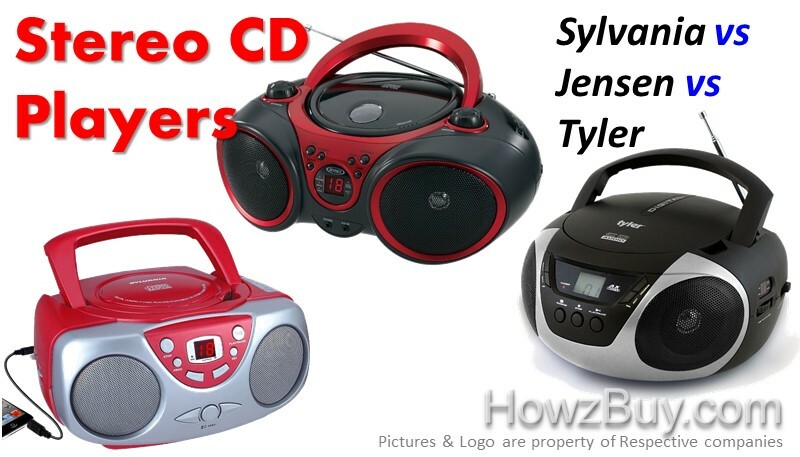 So I have enlisted Sylvania Vs Jensen Vs Tyler Portable CD Players for comparison and finding the best one for you. Which are the common Features in Sylvania SRCD243, Jensen CD-490 And tyler TAU101-SL Portable CD Player?? All these CD players are made using a plastic material. The Glossy finishing adds class to general look of the player with its foldable carrying handle. The Sylvania SRCD243 are available in six colors that are Black, Green, Pink, Red, Blue, and Silver. You have so many choices…..The Jensen CD-490 comes in four different color combinations this are Red/Black ,White/Pink, Black/Blue And Silver/black whereas the Tyler TAU101-Sl is available in Yellow, Blue or Silver colors. All the CD player have High performance Stereo speakers giving an enjoyable listening experience and boombox clear sound. In tyler CD player due to its programmable memory you can play 16/19 tracks and in Sylvania CD player 20 tracks which means it will play up to 20 tracks automatically on a particular order as well as you can listen to CD/CD-R/CDR-W.
All these CD Players have a built in analog FM/AM tuner. So you can choose from a more varieties of radio talk and music programs as well as you can enjoy your favorite songs anywhere. The telescopic antenna of a CD players ensures that you get clear and undisturbed sound at anywhere and anytime. All these CD players are portable means you can enjoy your favorite songs anywhere on the go!!! You can take these boombox CD players in a school or on the beach or anywhere you want to go!!! These CD players can be handled by your children or anyone easily. Here you can connect your headphones with all these CD players for quiet listening. These CD players has a AUX function which means this allows you to listen a tracks to your iPod/MP3 or other external digital audio devices. Devices are connected to CD players by using the auxiliary input jack (3.5 mm jack). CD-R/RW compatible and comes with a LED CD track display which shows you exactly how your CD player is responding. CD-R stands for Compact disc Recordable . CD-R disc can be written to only once (except in the case of multisession writing). CD-RW stands for CD Rewritable. CD-RW discs can be written many times, and they function somewhat like hard disk or floppy. All these CD players are having a playback buttons by using this you can skip or search a music track, forward the music tracks, go back, repeat one or repeat all music tracks and tyler has an extra added feature of One touch Random or Shuffle playback function. Good sound quality with 20 tracks programming memory, compact size, so many choices in colors at low price. It is cheaper as compare Jensen and tyler. ( We have observed that It has reported to have sound quality issues, also issues for the MP3 Compatibility ). Crystal clear sound. Portable CD player as well as built in AM/FM tuner. Attractive color combination look. Two way power that is you will still be able to listen music when the lights go off or you are in the outdoors where there is no light. So it is well worth your money. This is light in weight but slightly expensive than the Sylvania and Jensen as well as it also having best sound quality but you don’t have any color choices. It is available in color i.e Yellow, Blue or Silver. So overall finally I think Jensen CD-490 gives you a many more features in the best price. It is well worth your money. I hope I am clear in my opinion and hope this review will be helpful for you..!! !